This image shows two representations of the same infrared image covering a portion of Kaiser Crater. 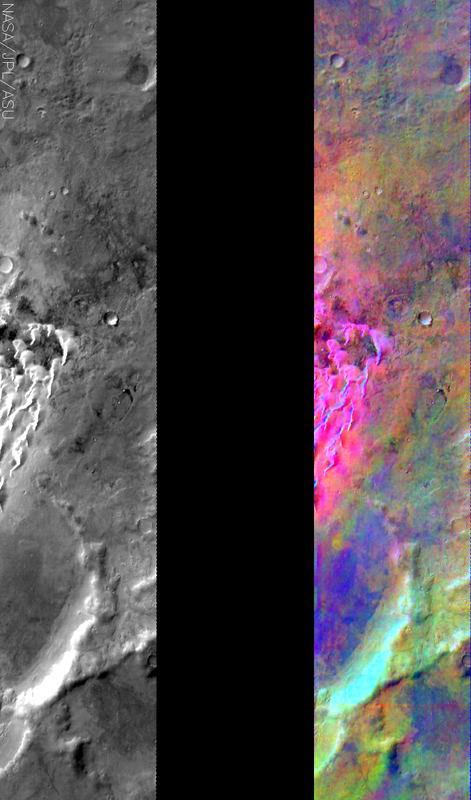 On the left is a grayscale image showing surface temperature, and on the right is a false-color composite made from 3 individual THEMIS bands. The false-color image is colorized using a technique called decorrelation stretch (DCS), which emphasizes the spectral differences between the bands to highlight compositional variations. In this image, the basaltic sand dunes in the bottom of Kaiser crater are colored a bright pink/magenta. The spectral features are clean and prominent on these dust-free surfaces and the dark color of the basaltic dunes helps them to absorb sunlight and produces higher surface temperatures, which also contributes to the image colors.